You have good improvement. 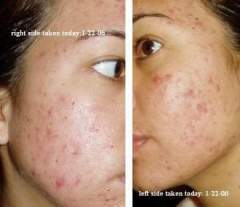 It looks like you dont have anymore active acne. You should clear up soon and I can tell already that you have great facial features so you must be pretty. I have the same issue with my nose. Its usually the first thing that gets oily. I have been putting Bp/ moisterizer on it but it doesnt seem to clear the blackhead. My nose is litterally covered with blackheads. I tried to squeeze them out last week but it left me with a bunch of redmarks that I still have. And the blackhead grew back. So...i guess i'll just leave it alone from now on. I use the gentle one w/o water. Its alot less drying for me. I also use the normal to oily too but I needed to use water with that so it dried my face. I will be curious to see the results also. Hopes this work. Biggg Pimple on chin pop it or not? Leave it alone until it comes out with little or no pressure. You do not want to make it worst by picking at it...I learned that the hard way and its alot worst (alot more red and could spread the bacteria around). I always wanted to try this but didnt have the guts yet. Hopefully you can inspirer me. Is this a way to clear up your face? 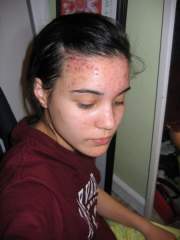 I had acne for about 7 years now and I used to do nothing to my face (just water) and the acne was off and on. But I didn't know about this site before so I would sleep on my side alot, touch my face with my hands, did not drink that much water, etc...so I don't know if washing just with water works and my bad activities triggers it to come back or what?